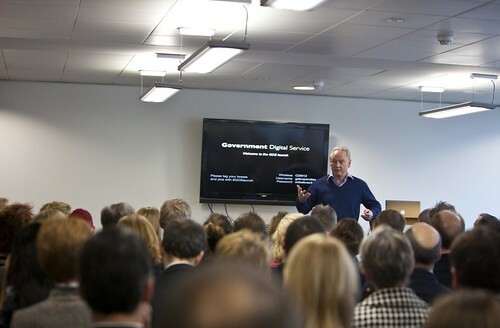 IdealGov started in 2004 to talk through the gap between the reality of government IT and smart people’s aspirations of what it could be like. It was a fun conversation, many interesting people listened and took part, but government IT got steadily worse. The archive is there to read (maybe I shd get it bound into a book). But I’m now working on other projects and IdealGov is pretty much dormant. But guess what: I scored an invite to today’s Government Digital Service launch. I feel I don’t need to do IdealGov any more. What they’re now up to seems exemplary, rapidly closing in on ideal. I watched, learned and loved it. Francis Maude came across at the launch as informal, well-informed, tough, natural. The government IT problem wasn’t just about competence or overspend, about the toxic mix of mediocrity and arrogance, or about greedy suppliers grown fat in the war on terror. The problem was one of intention. There seemed to be no sense of service, no empathy or warmth in what government was trying to do: just a language of coercion, targetting, and endless plans incorporating surveillance by design. This has now changed out of recognition. What we have in the new GDS is a team of breathtaking talent, design-driven, wearing their considerable power lightly, engaging with tenderness and respect, speaking with humility, mindful of their customers: those most in need of public services were repeatedly present in what was said. The country is now broke. Yet this team moved into new offices in four weeks and has the best IT in the business – Apple laptops, LibreOffice, mobiles and phat pipes – and they reckon it cost 18% of what standard issue non-ideal government IT would have cost. The development work is done in house. They use standard interoperable and modular tools. Anything they in turn produce is open sourced. Full praise to all involved: Francis, Martha, Ian, Mike, Tomski and the teams. Good to see Etienne and Emer there, and to catch up with the noble Lord Allan, Nigel Shadbolt, HarryM, Jerry, paulclarke, pubstrat and others. Tom Watson and Ruthie should have been there – you’d have both loved it. In her own image: Martha Lane Fox, appointed under the previous administration as UK digital champion, was credited for her original vision and unstinting support of what has become the GDS. Here are Tom Loosemore’s single government domain slides, with sneak previews of what new services such as maternity pay and universal credit might look like (embedded from Slideshare, in the new spirit of openness). Indeed. Dare we hope? Well of course. Let’s take nothing for granted. And let’s make plans based on the contingency that this might actually work.